Don’t you love having a yogurt? Or are you consuming it for your health? Many people are starting to utilize milk and making a lot of different stuff like yogurt. Now yogurt has been known as a product that can be bought everywhere. Many yogurt sellers start to produce yogurt in more artificial shape which resembles today’s food. One of them is Liberte brand. Liberte yogurt is a Canadian company which starts producing cheese in 1928. In 1964 the company started producing the yogurt and made a lot of different innovation with yogurt. One that has been popular is the Bioyogurt. Bioyogurt is yogurt which is mixed with the probiotic cultures which make the yogurt having a creamy and smooth texture. Bioyogurt is known for its positive health benefits which make yogurt more attractive than ever before. Liberte yogurt is more or less similar like that, but Liberte still has much other interesting stuff inside it, so let’s learn more about it. Liberte yogurt has the similar approach like other yogurts in term of taste. It has a sweet taste with the addition of fruity flavor and sweetened fruit juice. The sweet taste itself is made as natural as it can which is why Liberte using the sweet from fruit instead of sugar. Liberte yogurt is labeled as a natural product, however, don’t misinterpret this claim and said it as an organic product. All of its fruits are natural but not organic. Liberte yogurt contains active acidophilus and Bifidus cultures which can transform the lactose and milk sugar into lactic acid which is good for the digestive and help our body to process the food and absorbing nutrients. Liberte Yogurt is probably the safest shortcut to get a healthy digestive system. Not only that yogurt taste nice, but it also gives so many functions for your body. You can lower your blood pressure, get a better recovery, boost your immunity, and prevent the ulcers. With eating Liberte yogurt, you can get a big amount of potassium which will help you to flush excess sodium inside your body. This process is affecting your blood pressure and lowering it by a big margin. You can also recover faster after doing a heavy exercise because Liberte contains amino acids and protein. The protein and amino acid will make your recovery faster, and you will probably get a better mood because of its taste. Liberte yogurt is not a miraculous product but worth to be consumed if you want to live a healthy life. Other than the healthy aspect, Liberte is not a very good product for the diet. It is mainly because Liberte is not intended for the weight-loss. In overall Liberte yogurt is very similar to the common yogurt. But with the big name and long history on its back, it is worth to try this product. The quality itself is pretty decent, whereas Liberte yogurt is best to be used for preventing many digestive symptoms. But for you who wants to get a weight loss food, Liberte yogurt is not the best one. 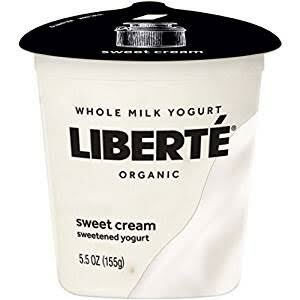 Check the best price for Liberte Yogurt here!